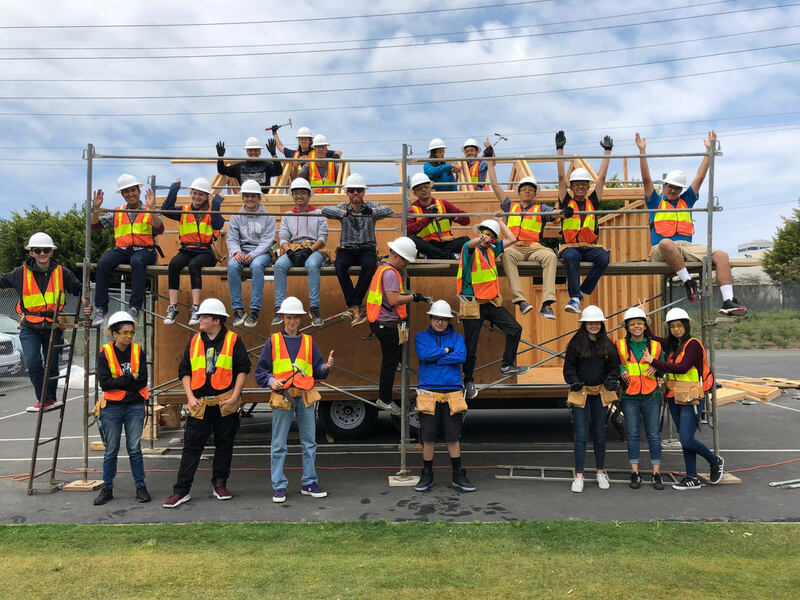 The Civil Engineering and Architecture class at Da Vinci Science held its final gathering on June 25, a banquet celebration to hand over the keys to the tiny house they built for Da Vinci RISE High and to honor the contributions of the students, staff, partners, mentors and supporters who contributed to this project. 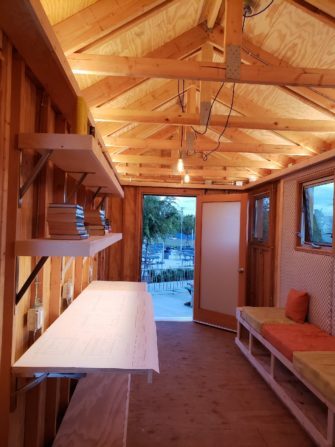 The 20’ x 8.5’ open concept tiny house with outdoor planters was designed to serve as a secure space where students from Da Vinci RISE High can attend private counseling sessions. RISE High is Da Vinci’s newest school for homeless and foster youth and other students who have struggled in traditional school settings. 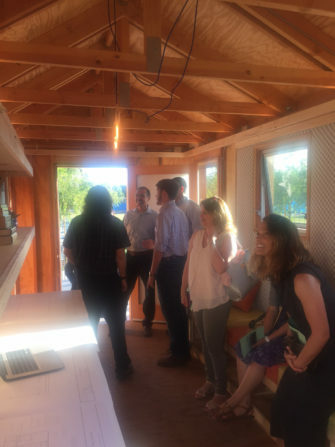 The Tiny House project grew out of two separate conversations with Gensler, the architecture firm that designed the new building that houses Da Vinci Science, Da Vinci Design, and Da Vinci Communications high schools. Andrew McGregor, the civil engineering teacher at Da Vinci Science, was looking for a final project deliverable where students could apply the skills they would learn in his class. RISE High was seeking Gensler’s help to design a mobile resource center that would be used to meet RISE youth in the communities where they are. Heidi Hampton, an architect at Gensler, connected the two groups together. Soon thereafter, a planning meeting was held to gain a better understanding of the needs of both groups. Gensler provided the conceptual design for the space, while Russ Tyner and Houston/Tyner provided the detailed framing design. Meanwhile, professors from the Construction Management Department at Cal Poly San Luis Obispo helped to develop an organizational structure for the construction site: the students were organized under a pyramid, with two female superintendents in charge of distributing information to the foremen, and four foremen each in charge of a team of students, with the purpose of keeping all students working together effectively and safely. During the semester-long build, students learned a wide range of hands-on skills including safety, measuring, proper hammering, drilling, nailing, sawing, framing, insulation, waterproofing, drainage, and more. Elina Luong, a Da Vinci Science senior and one of four circular saw specialists on the tiny house project, said she has a much greater appreciation for all of the structures around her. This project had an army of volunteers. Also contributing their time, expertise, and resources were Carol Prendergast and Oculus Light Studio, Ganahl Lumber, WAC Lighting, CALI Lighting, and Targetti. Don Wallis, a retired dentist and the father of Da Vinci Science principal Steve Wallis, served as the students’ primary construction mentor. The elder Wallis was recognized at the banquet for all the ways he supported students and for showing them the importance of precision and paying attention to details, since a minor mistake can create a major setback. But equally as important, he said, is learning from those mistakes made. Industry partners, friends and family experienced the tiny house first-hand at the banquet celebration. The tiny house may eventually be used at both the RISE-Hawthorne and RISE at A Place Called Home locations. The civil engineering and architecture course uses Project Lead The Way curriculum, the gold standard of project-based STEM curricula. The Civil Engineering Pathway at Da Vinci Science is one of nine career technical education pathways offered at Da Vinci Schools. All students at Da Vinci simultaneously prepare for college and career by taking college preparatory coursework and career technical education classes. 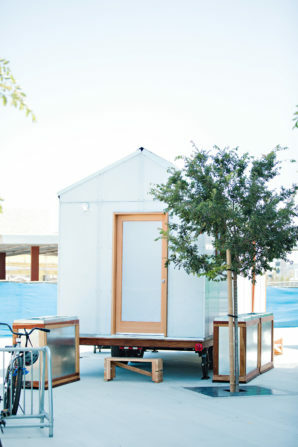 To learn more about the tiny house project and construction process, visit the construction blog at https://dvsconstructionproject.weebly.com/blog.